DemoCurmudgeon: Walker Foxconn Legacy in Shambles, Gov. Evers to clean up another mess. Walker Foxconn Legacy in Shambles, Gov. Evers to clean up another mess. What Foxconn offered Walker and the panting Republicans was well beyond their limited view of tech as things undeserving poor people had, like flat panel plasma TV's and Obama cellphones. Tech things were used more as epithets than real things that created jobs and grew economies. Foxconn's decision to suspend work on the two plants because of "weakening macroeconomic conditions and the uncertainties brought by the trade war" and in Wisconsin, "as a result of negotiations with new Gov. 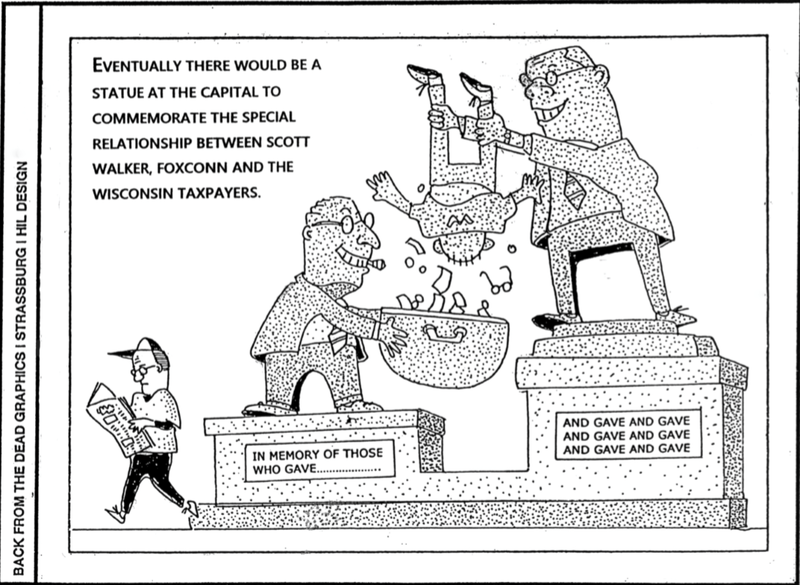 Tony Evers." Foxconn's Thursday statement hinted at its new focus for the Wisconsin plant, saying the global market had "necessitated a reconsideration of which technology will best suit the needs of its customers." Louis Woo, in the interview, said about three-quarters of Foxconn's eventual jobs will be in R&D and design—what he described as 'knowledge' positions—rather than blue-collar manufacturing jobs." Gousha: "What would be the message if for some reason this deal got bogged down, and didn't happen..."
Hogan: "I...it's not going to happen Mike...but I don't see that happening...it'll get through the Assembly, it'll get through the Senate because they want it, they want the right thing to happen." I'm just guessing here, but even if Foxconn misses a few deadlines, if they eventually make good on their agreement, they get all the incentives they missed, meaning Wisconsin can't spend that money on other things for the life of the contract. Urban Milwaukee: Who would have the IP rights? 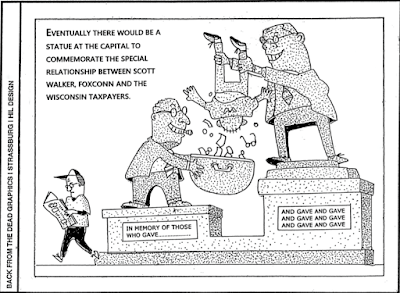 “The cooperation agreement lists three different types of research agreements ... two agreement types grant Foxconn the intellectual property that comes of research.” That seems like a problem for UW faculty,” the story reports. “The fruits of research at UW belong to the people of Wisconsin, not to a private corporation,” the UW-Madison Teaching Assistants Association declared in a statement to the State Journal. One tech industry insider tells me he talked to Foxconn representatives who said Rockwell CEO Blake Moret met with Foxconn leaders about Rockwell doing contract manufacturing for Foxconn. But Foxconn eventually noted it would get intellectual property rights to any products it made. “Moret blew up and walked out of the meeting,” the source says. 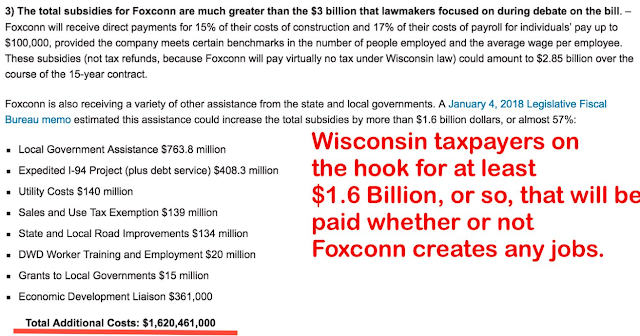 Robin Vos blames Evers for Foxconn: Even after just a month as Governor, Tony Evers is now being blamed for Foxconn? Sure, why not. Note: Vos is claiming economic uncertainty from Evers? Even though the national economy is still running hot after Trump broke all trade deals, levied tariffs, shut down the government, lashed out and asked for boycotts of Harley Davidson and other companies, and is threatening to take everyone's health care away. It's gonna take a lot of uncertainty to hurt Wisconsin's economy?